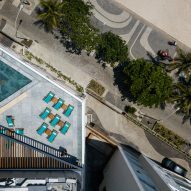 Hotel Arpoador is located close to the Pedra do Arpoador – a rocky peninsula that separates the city's famous Copacabana and Ipanema beaches, and is a popular spot for watching the sunset. 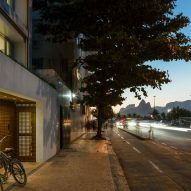 The 49-room boutique hotel recently reopened after Bernardes Arquitetura overhauled the exterior and interiors. 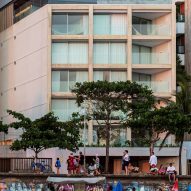 "The renovation of the Hotel Arpoador goes beyond the idea of a cozy hotel, creating an inviting space, where interior and exterior are blended," said the Rio-based studio. 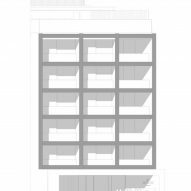 Due to the urban plan, the building has two street-facing facades. 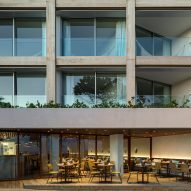 The hotel's main guest entrance is tucked around the back, while the ground-floor restaurant, bar and balcony open towards the beach and promenade. 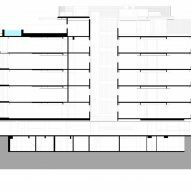 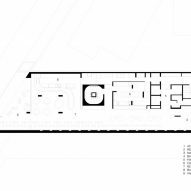 The site is also angled at the ocean-view end, creating triangular spaces across all levels. 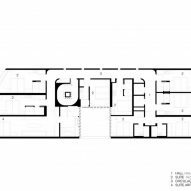 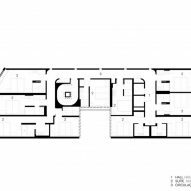 These include the ground-level terrace, the balconies for the largest rooms, and the roof patio. 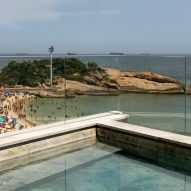 The layout of the top deck also informed the shape of the small pool, which is tucked into the corner beside the glass balustrades for the best views. 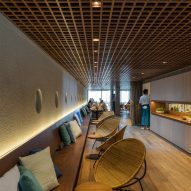 Deck chairs are laid out on the rooftop for sunbathing and a bar serves cocktails, while the uppermost level also houses a spa, massage room and gym indoors. 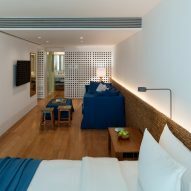 On both sides of the building, Bernardes Architecture added timber boards to surround the floor-to-ceiling windows of the guest rooms. 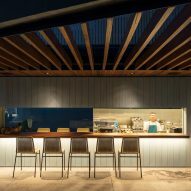 "The facade is composed of a large wooden panel loose from the structure, which frames the views for those who see from within and creates a subtle order for the building," the firm said. 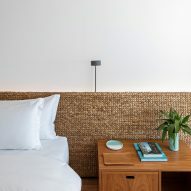 Interiors are decorated with materials chosen to evoke the ocean, like woven straw, linen, cotton and wood. 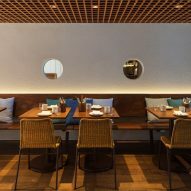 Blue fabrics provide accents against the otherwise neutral palette found throughout the building. 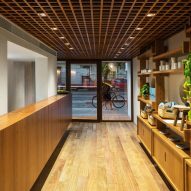 The furniture, upholstery and woodwork were custom designed for the hotel. 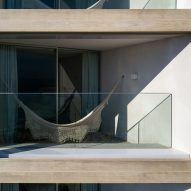 "In allusion to the nautical architecture, the furniture of the rooms is made of pieces that fit together, allowing different uses," said Bernardes Arquitetura. 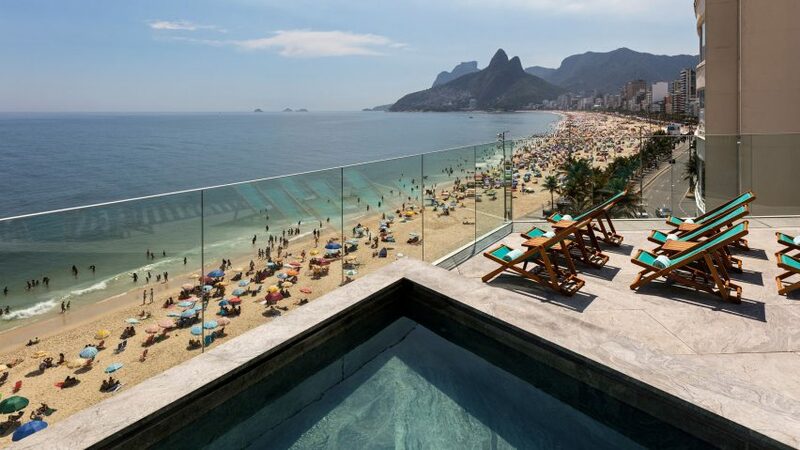 Rio's beaches are lined with hotels, providing options for travellers on all budgets. 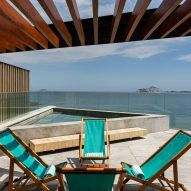 At the high end is the Emiliano Hotel, which Oppenheim Architecture and Studio Arthur Casas designed with an infinity pool facing Copacabana, while the Yoo2 hotel offers more affordable accommodation in Botafogo.